On Thursday evening, Sen. Bernie Sanders addressed his supporters in a speech from Burlington, Vermont. Sanders didn't formally withdraw from the Democratic presidential race; instead, he outlined the many ways he plans to continue his "political revolution" at the state and local levels in years to come, and strongly encouraged his supporters to stay involved in progressive politics beyond the 2016 campaign. Sanders also stressed the importance of defeating Donald Trump in November. Although Hillary Clinton has effectively clinched the Democratic presidential nomination, Sanders didn't end his candidacy on Thursday. He is expected to do so soon enough: Clinton has won a majority of votes, pledged delegates, superdelegates, and states in the Democratic primary. But on Thursday, Sanders was mum on his presidential aspirations, and instead focused on the changes he wants made to the Democratic party. "I look forward, in the coming weeks, to continued discussions between the two campaigns to make certain that your voices are heard and that the Democratic Party passes the most progressive platform in its history and that Democrats actually fight for that agenda. "I also look forward to working with Secretary Clinton to transform the Democratic Party so that it becomes a party of working people and young people, and not just wealthy campaign contributors: a party that has the courage to take on Wall Street, the pharmaceutical industry, the fossil fuel industry and the other powerful special interests that dominate our political and economic life." Clinton became the presumptive Democratic nominee after winning the California primary on June 7 (or perhaps the night before, if you ask the Associated Press), and ever since then, Democrats have been anxious for Sanders to withdraw from the race and endorse Clinton. 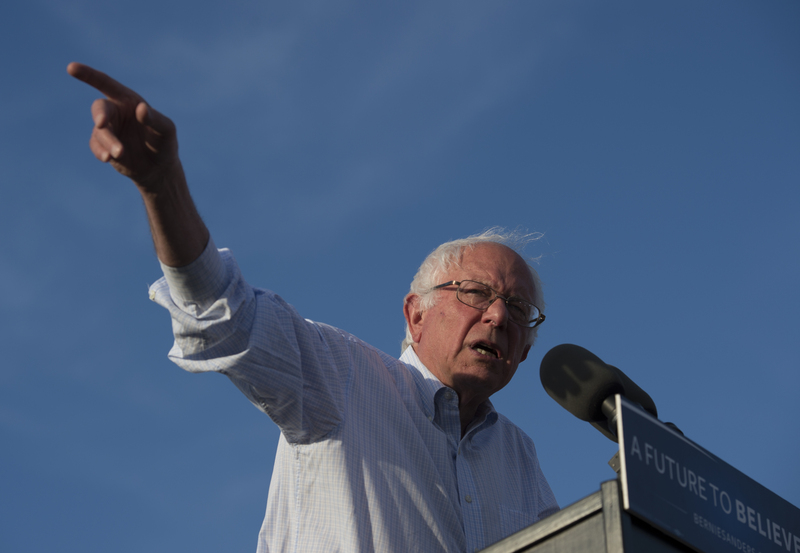 The unexpectedly tense primary between the two exposed a rift between between the party's centrist and liberal wings, and as soon as Sanders ends his campaign, the sooner the healing process can being. It's more or less a sure thing that Sanders will eventually end his campaign and endorse Clinton. His comments indicated that he'll be doing this sooner rather than later. "The major political task that we face in the next five months is to make certain that Donald Trump is defeated and defeated badly," Sanders said. "And I personally intend to begin my role in that process in a very short period of time."